Our second sea day consisted of another anticlimactic morning of sleeping in. Also, we forgot to put out our Do Not Disturb sign and didn't flip the dead bolt, and based on a few awkward interactions with our cabin steward, we're fairly confident that he walked in on us while we were snoozing. 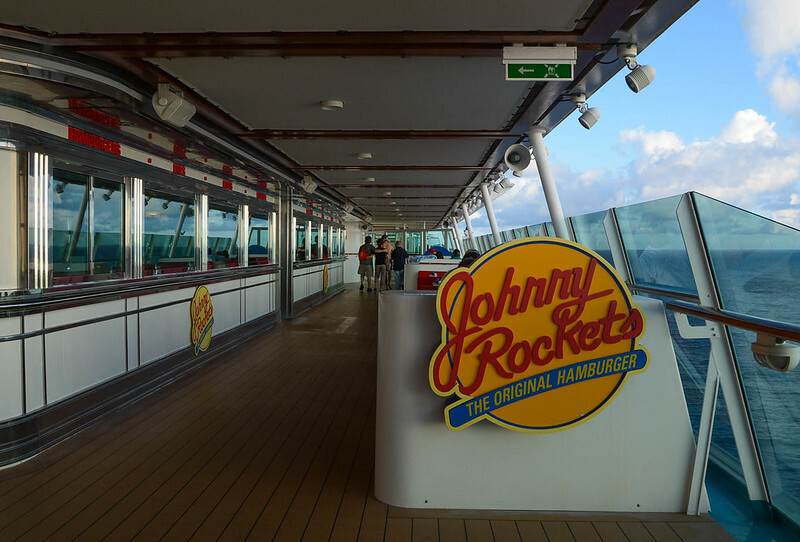 Already sick of the Windjammer, we decided to eat lunch at Johnny Rockets. There's a $5.95 "dining fee" per person. I swear this used to be $4.95, and I think charging $6 for a burger is a little ridiculous. You do get to order whatever you want from the menu (Except milkshakes which are additional... and there is a Crown & Anchor Society credit which gives you buy one/get one shakes. Also, soda is included for those with the soda or beverage package). 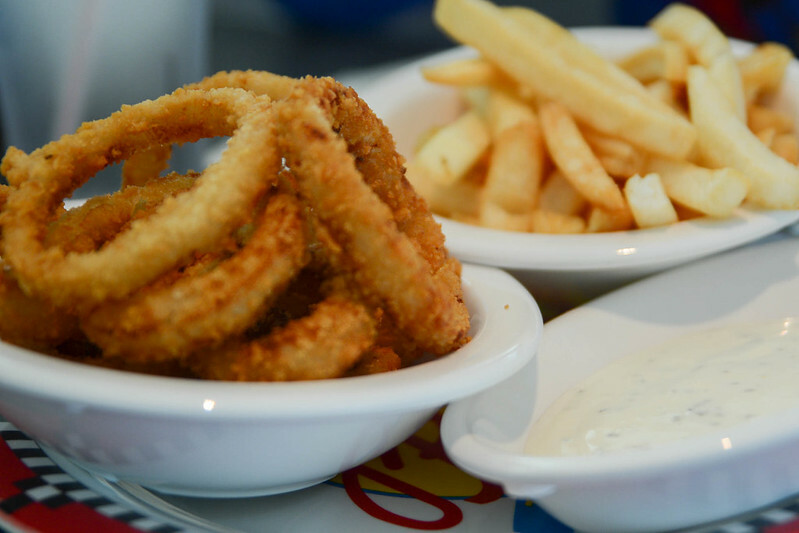 Half Fries/Half Onion Rings are a good go-to appetizer. 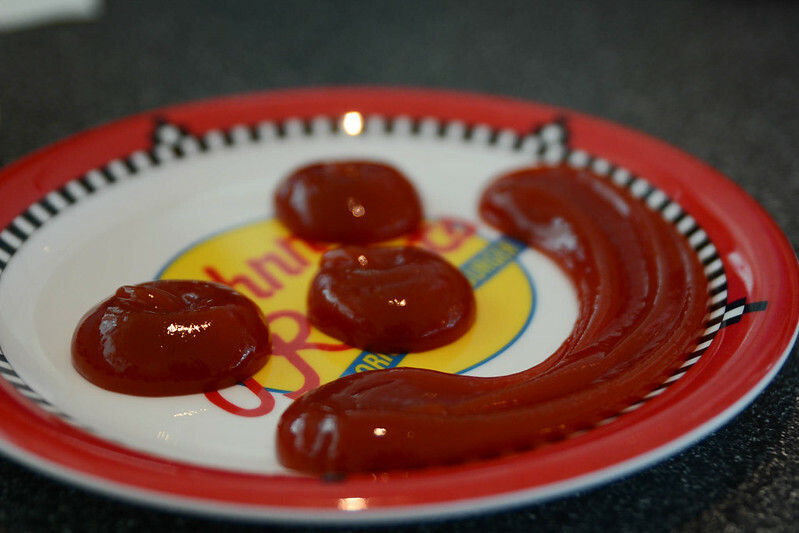 The ketchup at Johnny Rockets is always happy. My dad had the Chili Cheese Fries. 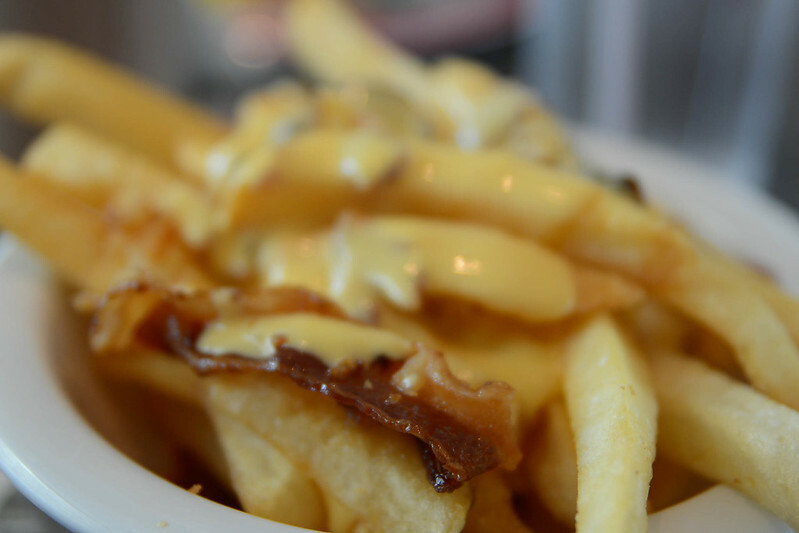 And I had the Bacon Cheese Fries. I liked the Chili Cheese better. I agreed to be the other half of my dad's BOGO milkshake, but I didn't really care for it. I don't really enjoy sweet drinks, and the chocolate milkshake was just too sugary for my taste. 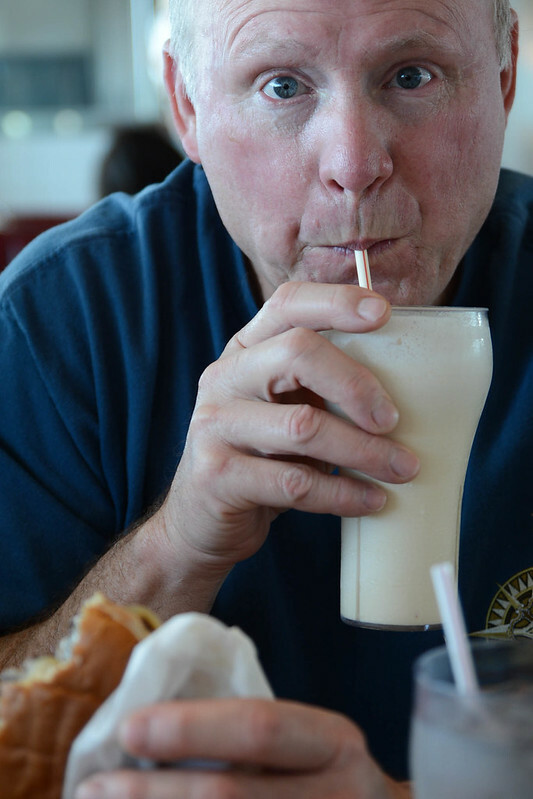 Dad, however, enjoyed his vanilla milkshake. I had the Smoke House Burger, and I enjoyed it, but it was very big and I couldn't eat all of it. I suppose maybe I can understand why they charge $6 to dine here. 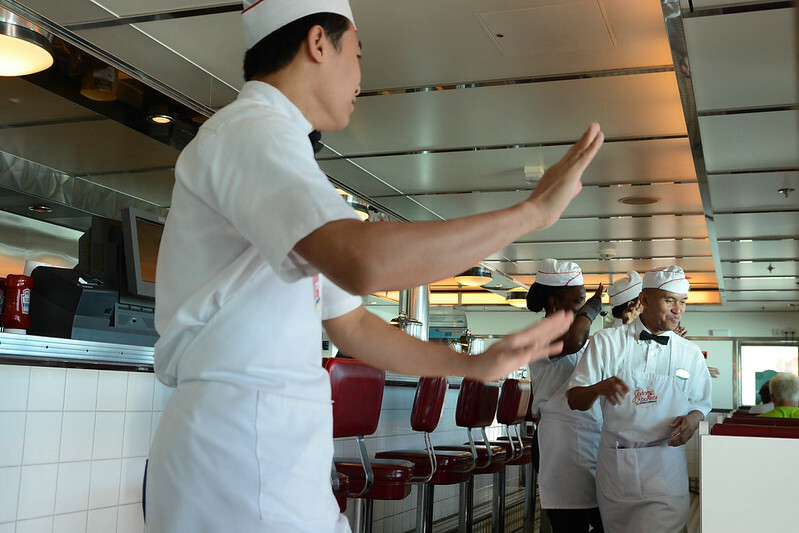 Part of the fun experience of Johnny Rockets is the dancing waiters. And they always want Rachel and me to dance with them. Rach used her bum foot as an excuse to stay seated, but I felt obligated to join them and make a fool of myself. 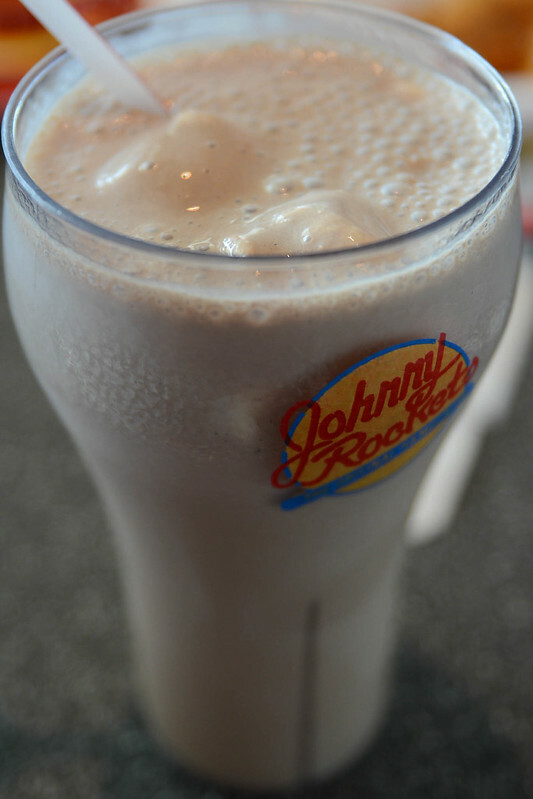 Dessert is also included at Johnny Rockets. 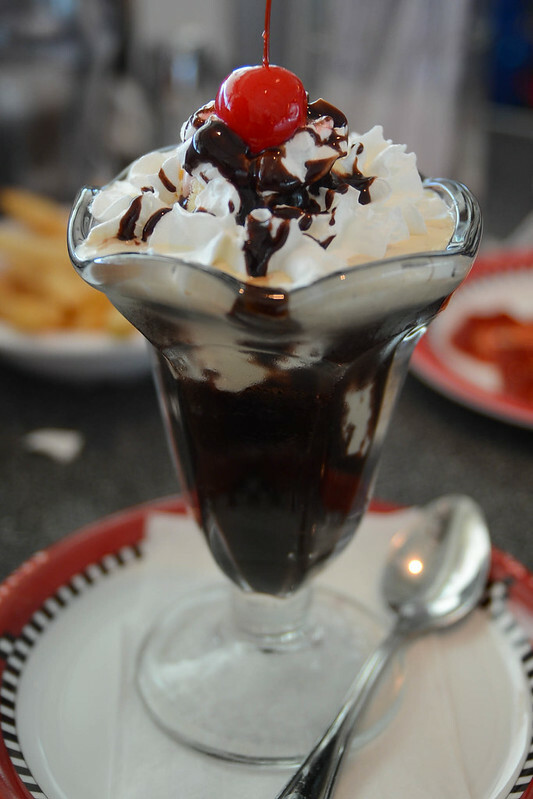 The Hot Fudge Sundae is lovely (and delicious). 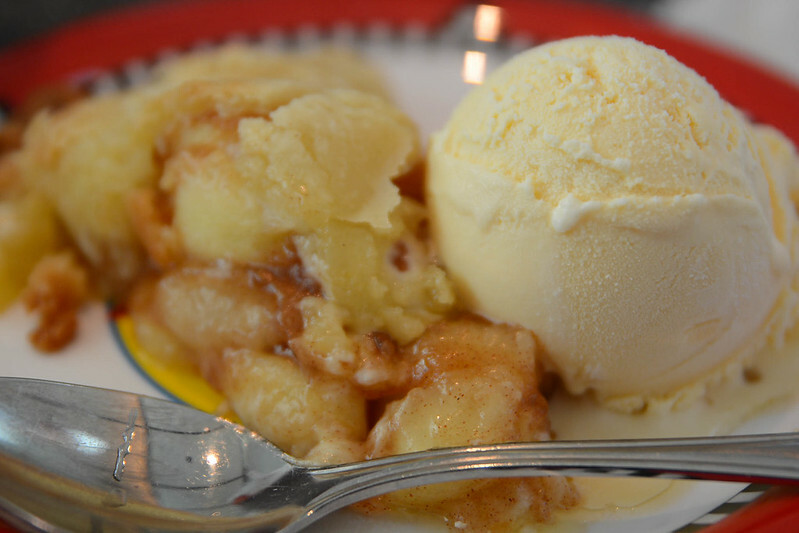 I had the Apple Pie a la mode which was also very good. 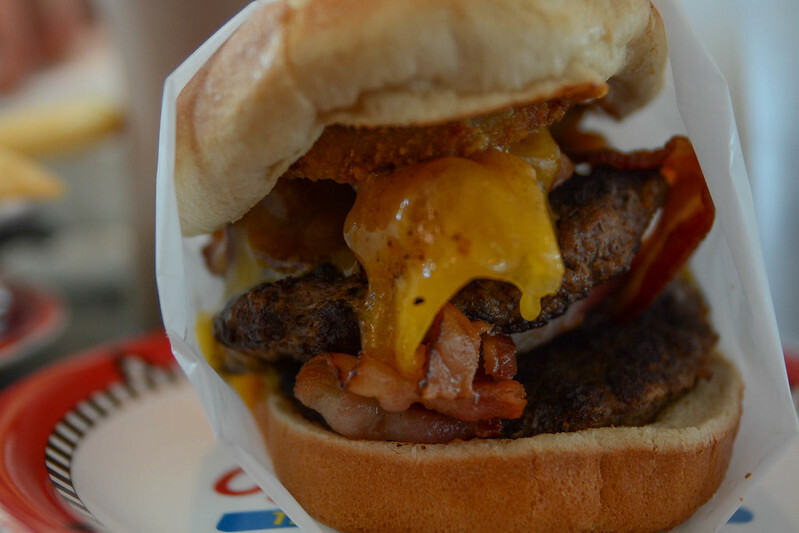 Is Johnny Rockets "worth it"? It's a cute restaurant. 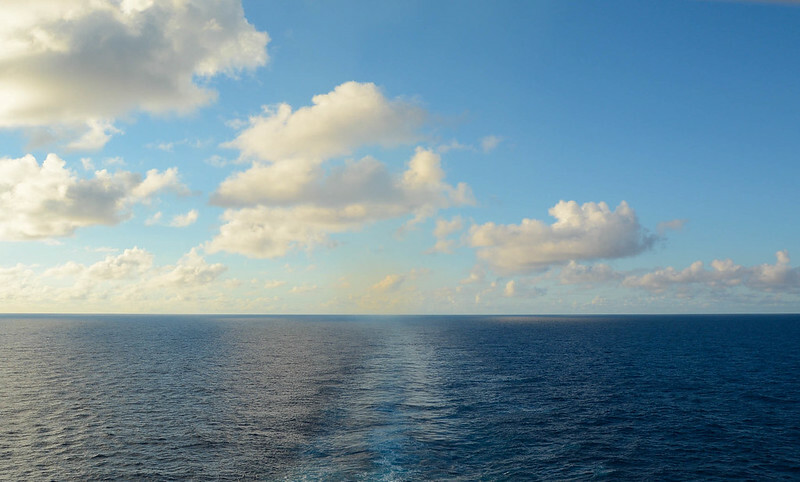 However, there are franchises everywhere (which have more extensive menus), so I wouldn't feel particularly obligated to eat there on a cruise. I do think it's a good break from the typical buffet food, and it's nice to be able to go and be seated, not having to worry about finding a table or waiting five minutes for the person in front of you to carefully select the bacon for their burger in the Windjammer. Also, I'm a little bitter about this price increase. $5 is like whatever, pocket change. But $6? Who do you think you are - Serendipity? In all seriousness, I understand the reason for the cover charge is more for crowd control than the cost of the food. 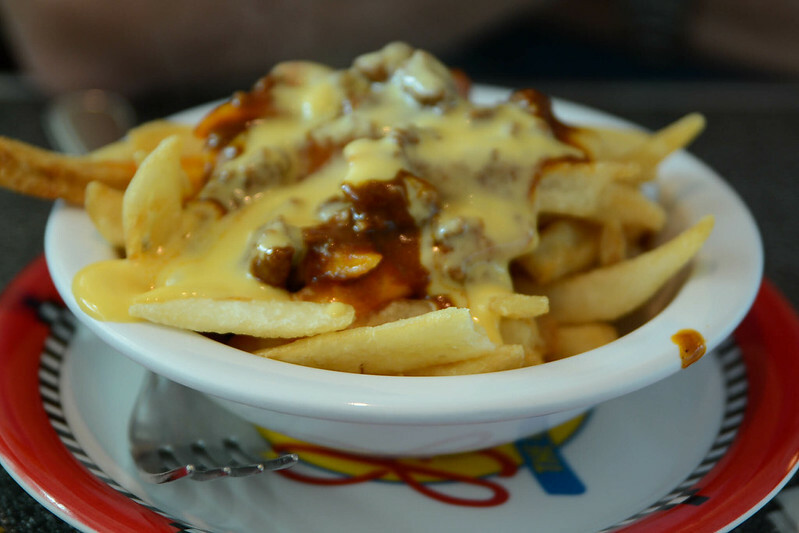 But I really wish that there were a la carte prices so that you could just go in and order chili cheese fries. Because sometimes I just want fries, but if I have to pay $6 just to go there, you bet I'm going to order every dang thing from the menu (kidding... but at least each course). The day before, we met a guy in the hot tub (a dentist from Canada) who loves the Flowrider. He told us that he books his vacations based on places that have Flowriders. And he tried to convince Rachel and me to try it. 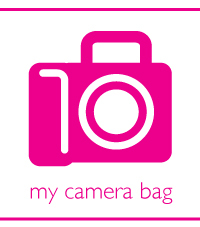 Don't get your hopes up - you will see no photos of me on the Flowrider because I never did it. And Rachel had a walking boot on, so she definitely wasn't doing it, and I'm thankful that she didn't follow through with her plan to force me to. 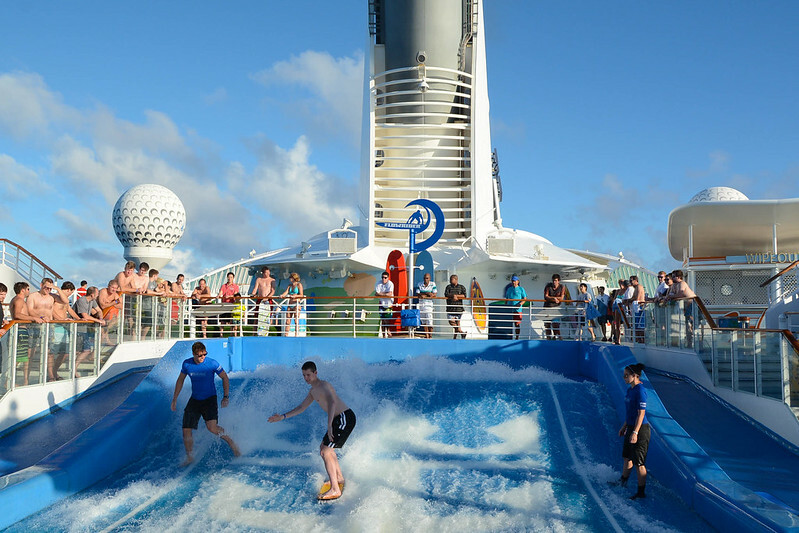 I enjoyed watching other people do it (meh, let's be honest - I enjoyed watching people wipeout more). But I just had no desire to get out there and try it myself. It just seemed like too much effort. First I would have to fill out a waiver, signing away my health. Then I would have to stand in a ridiculously long line. 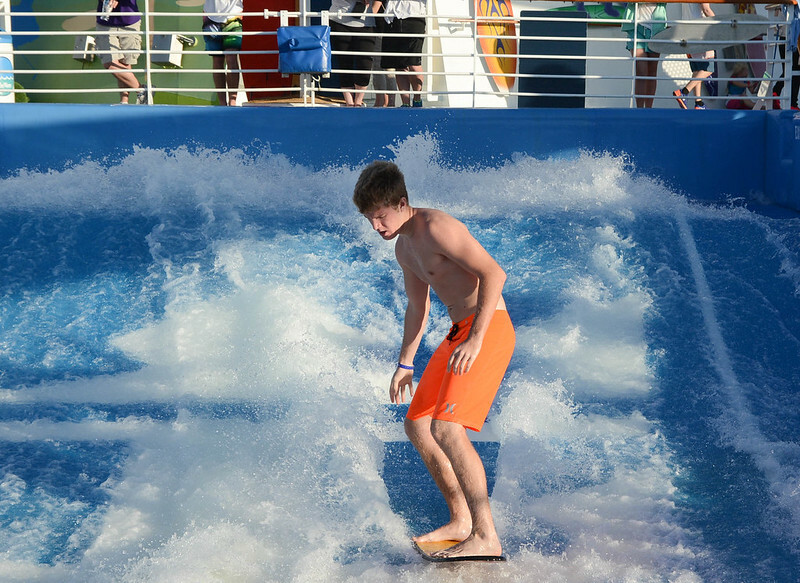 I would have to get a perfectly good t-shirt wet (because Flowrider guy warned us that we should wear shirts because the water will push your bikini top up). All of that just to fall down and get washed away by a powerful jet-stream of water. Maybe next time. Our Canadian Flowriding fan was really good, though. Definitely the best I saw all cruise. 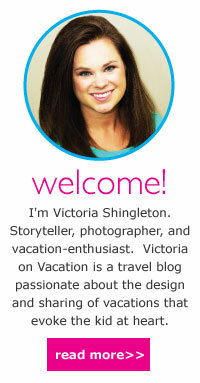 I guess if you vacation just to Flowride, you must be pretty great at it. We watched stand-up Flowriding. They also have kneeboarding. 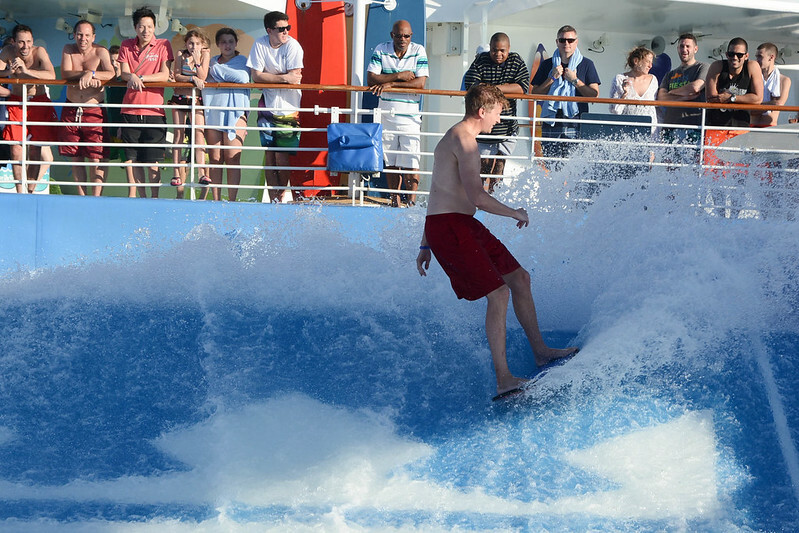 We were told that on megaships Oasis and Allure, there are two Flowriders - one dedicated to kneeboarding and the other stand-up. And they do help you out. The employees will show you how to stand on the board and hold your hands, walking you out towards the center until you get your balance. I swear that the spa service that Royal Caribbean contracts has had a name change because I know I have filled out those exact forms before, but I don't remember it being called "timetospa". Anyway, Norwegian uses the same spa company on their cruise ships, too. I'm not a big massage girl. Rachel gets a massage every cruise, but I haven't had a massage since the Serenade of the Seas in 2010.... when I was in high school! Lately, though, my back has been hurting... perhaps due to my old age or maybe the heavy bookbag that I carry back and forth to school. Whatever the reason, I really wanted a massage. Rachel suggested that I try the hot stone massage, so I did. I've always been curious about hot stones, especially since they might be shown in at least 70% of all massage advertising materials. First my masseuse asked me my age. I know I have a baby face, but I'm getting a little tired of people telling me I look 17. 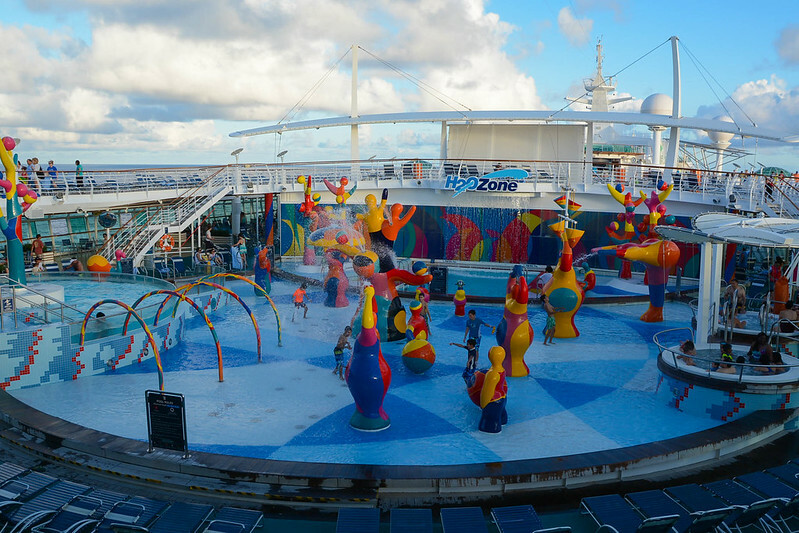 But apparently Royal Caribbean has a Teen Spa, now, and the prices are better. So if you are under 18, you should definitely check out the Teen Spa menu. I really enjoyed the massage, though. The hot stones were neat - I didn't know much about them, but it turns out that they don't just set them on your back, but rub them all over first. I thought it was a good pace, and she did spend extra time focusing on the area that I had pointed out to her as being a trouble spot. The end of spa procedures is what makes me really uncomfortable because that's when you get a sales pitch. They'll write you a "prescription" and tell you all of these things you need to do, using big fancy buzzwords like "toxins". So the entire time she was giving me her "scientific" reason for my back pain, I was just waiting for the sales pitch. At one point, she told me all of this stuff I need to do and looks at me - "Will you do this for yourself, Victoria?" "Uh, I don't know." "What don't you know? Don't you want what is best for your body?" "I ... I guess." "Then why won't you do this for yourself?" "I don't know.... aren't you trying to sell me something? Because I'm not really in a good place to buy things right now." I might have offended her. She told me that she wasn't trying to sell me anything and gave me my "prescription" on a card so that I could come back if I decided I did want to buy the products that she wasn't trying to sell me. I tipped her additionally for my awkwardness. So despite my social weirdness, it was good. And I think I'll get a massage again... and I won't wait five years this time. Rachel and I were a little late to the dinner since we didn't have much time to get ready after our massages. 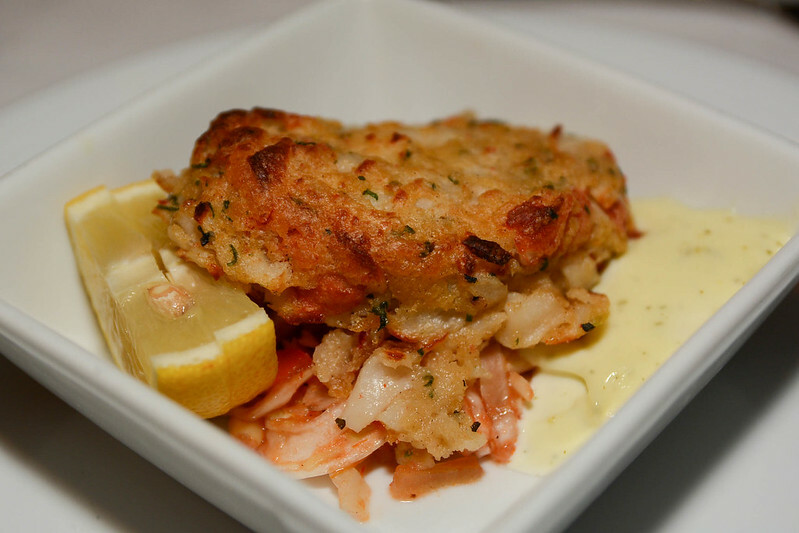 For my appetizer, I ordered the Crab Cake. 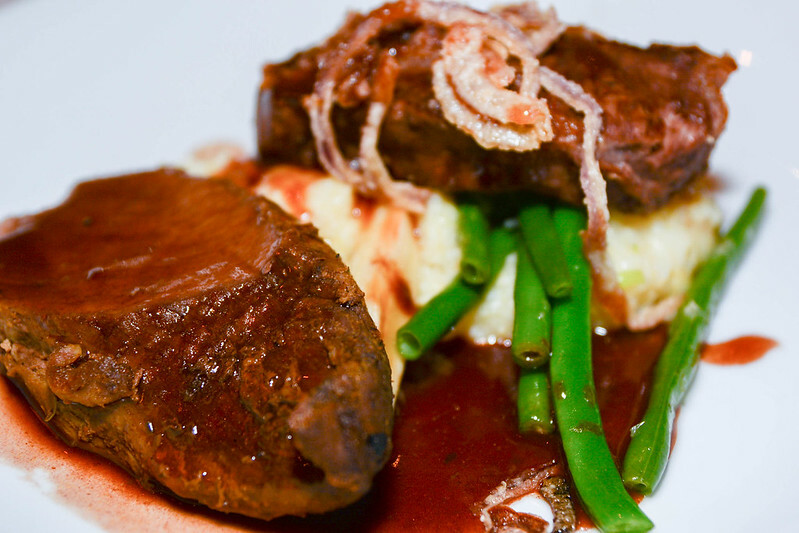 I wasn't feeling the menu that night, so I ordered the Aged Hand-Cut Manhattan Strip Steak off the classics menu. I liked it just fine... definitely not the best steak I've had, but it was edible. However, Rachel also had the Strip Steak twice on the cruise, and she complained about its lack of flavor each time. 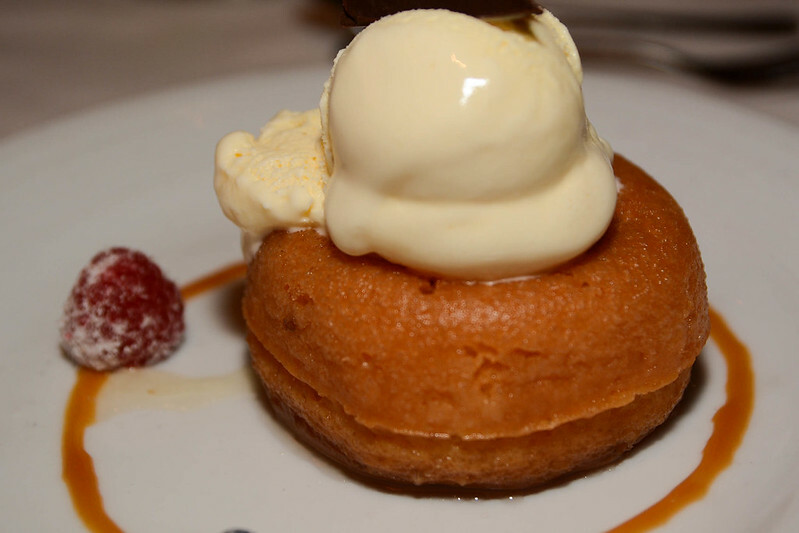 And for dessert, the Rum Baba Cake was alright.